There was such a joy and sense of fulfillment as we celebrated Christmas & New Year with one Spirit. At the church celebration crowning JESUS as the Lord of Lords & King of kings we had Dani dancing with the ART COMPANY team hiphop. The worship dance troupe did Banner & Tambourine. 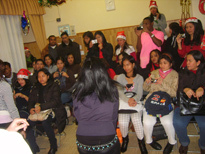 The Choir sang Christmas Carols. The message commemorated the profound essence of JESUS LOVE TO ALL MANKIND. Potluck, Games, Overnight fun time of sharing. These … were extended to the New Year´s Eve at Rey & Viv’s place and the Three Kings celebration (6th of January, Spanish tradition) with “ROSCON” on a long table dinner fellowship after a bowling tournament. What a family of God! Only if we could truly live in love & unity as we are instructed to, we would experience heaven on earth. Amen! Kathy: (fr. California, USA) I will never forget such an experience the rest of my life! Greg: (fr. Nigeria) This is the very first time I´ve ever felt being part of a church, it is family acceptance & not pure religiosity as I experienced in the Catholic church before. Nora: (fr. Philippines) I was looking for a Church and this is different. Pastor, I would like to stay here because it is the love and unity you have with one another that makes the difference. Helen: (an invited guest, Filipina) Can I come regularly to your church, I never thought that it was fun being a Christian. JORGE & LUPE – (a Peruvian couple with two kids. 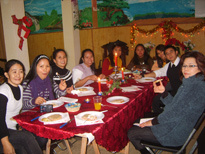 Seven years in Spain, seeking for the fulfillment of God´s promise in their lives to be used in the ministry.) 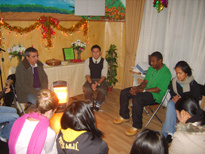 Jorge was a former student of Rey during his discipleship training with YWAM. Got into the business world. Had a private construction firm, lived a wayward lifestyle. Until he got back to Rey for help and now was given a chance to be part of our ministry. He began serving with us by doing the physical renovation of the church building. Praise God that now we have a presentable place of worship. Consequently, the difficult economic crisis here in Spain has affected severely all construction works. So now only his wife is working (doing a cleaning job in a supermarket). With the house & car loans on top of all the bills and daily needs, they could barely make it. Despite of this desperate situation, he still would like to help in the ministry. Please help us to pray for a financial breakthrough in Jorge´s life. The CHURCH IN MALLORCA – seeking for Rey´s help for Spiritual covering. Like flocks without a Shepherd. Lord willing, F.I.R.E. vision leadership development course could possibly be a tool to help them to be able to establish as a church. Please pray for God´s leading on this as Rey considers to help them. The ART COMPANY vision of recruiting part time or full time missionaries to carry on with the big responsibilities and many open doors to evangelize Spain through creative arts. (a couple from the US & a single lady from England are some who are considering to come and on the process of raising their support). The FIRE VISION L.D.C. (Leadership Development Course) multiplication as a tool for effective discipleship reaching this nation. We are tapping the former students to be exposed to train others as we recruit new batch which will start in February til April 2010 here in Madrid. The joy of serving the Lord gives us fulfillment despite of the many challenges. You are a part of these opportunities to fulfill God´s great commission in evangelizing and discipling nations. Without you these open doors cannot be reached with the Gospel message and disciples will not be multiplied. We are continually counting on your financial support to meet our family and ministry needs. We trust that the God of the Harvest who called us to be partners in His vineyard will never run out of resources. Your generosity would definitely be returned a hundredfold! Once again thank you so much for your love and passion for God through your giving. New Year´s Eve at our place.